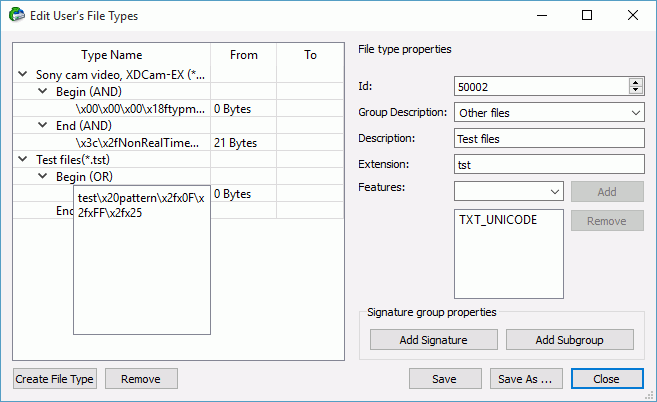 You may create your own known file types and add their file signatures for scanning in Known File Types. They will appear in their respective folders on the File Types dialog box. You can do that either by using the R‑Studio's graphic interface or by direct editing the known file description file specified on the R‑Studio Main settings dialog box. The easiest way to add your own is to use the R‑Studio's graphic interface. Digital file type identifier. Should be unique for each custom file type. 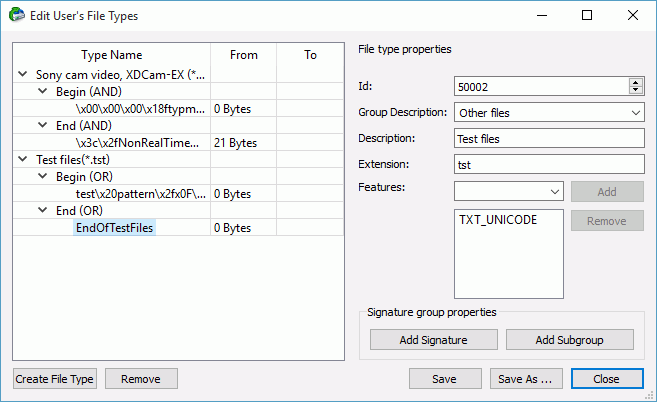 Specifies a file type group in which found files will appear. You may specify either your own groups or select those predefined on the File Types dialog box. Additional properties of the file type. If you want to specify several properties, they should be separated by a space. NO_SCAN : Not to be scanned for. If this flag is used, R‑Studio will not search for such file type. Such files will be shown when sorting files by their extensions. TXT_ANSI : The file can be viewed as ANSI text. If this flag is specified, the file can be correctly represented as an ANSI text. When previewing, this file will be immediately sent to Text/​hexadecimal editor . TXT_UNICODE : The file can be viewed as UNICODE text. If this flag is specified, the file can be correctly represented as a UNICODE text. When previewing, this file will be immediately sent to Text/​hexadecimal editor . Specifies from where the signature begins. If End , the offset is from the end of file to the first byte of the signature. That is, if the signature is two bytes long, the offset value should be 2 . A decimal number specifying the leftmost possible offset for the file signature. A decimal number specifying the rightmost possible offset for the file signature. You may specify as many signatures as you need. 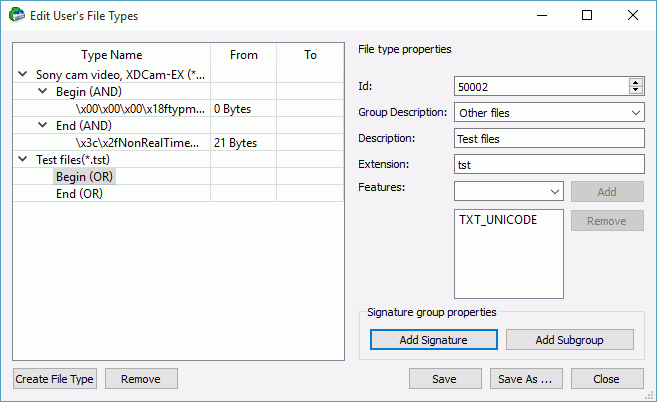 Moreover, you may specify subgroups within a signature using the Add Subgroup button. The structure of such possible subgroups is described on the Customizing File Types-II help page.